(c) 2014 Crain Communications, Inc.
As a kid in the 1970s, Bill Daker recalls frequent outings to Lasser’s Beverages, a now-defunct soft-drink company on the North Side, where he and his brothers would swig a 32-ounce bottle of black cherry, blue raspberry or cream soda for 50 cents. Today, Mr. Daker is president of Cool Mountain Beverage Inc., a throwback line of neon-colored sodas he launched in 1997 with his brother John. “The old pop-shop flavors, the glass bottles—it’s all memories of what we had when we were kids,” he says. The kings of carbonated beverages may be suffering as consumers cut back on everything from Diet Coke and Diet Pepsi to Fanta and Mountain Dew. But for Des Plaines-based Cool Mountain and other little guys such as Jones Soda Co. of Seattle and New York’s Brooklyn Soda Works, these are the good old days. Cool Mountain’s revenue is up 30 percent this year from 2013 and the company booked its first profit last year, though Mr. Daker declines to provide financial figures. Its soft drinks are available in 21 states, including Illinois since Aug. 1, and Canada, Britain and Singapore. Cool Mountain’s sodas come in seven flavors—the top sellers are black cherry and strawberry. Like other craft bottlers, it uses 100 percent cane sugar and no high-fructose corn syrup. A 12-ounce bottle sells for $1.50. By comparison, Walgreens in mid-July was selling a six-pack of 16-ounce bottles of Coca-Cola for $2.50. The brothers cooked up the business in 1995 after Mr. Daker was laid off as an electrician at Chicago-based Montgomery Ward & Co. They spent two years working with three private-label beverage companies to capture the flavors of their youth, financed with $150,000 from personal savings, family loans and credit cards. John, 48, left the business in 1999 and does maintenance work in Arizona. Another brother, Jim, 63, remains a minority owner. Better times came in 1999, when Mr. Daker stopped manufacturing Cool Mountain’s sodas with two Chicago co-packers and instead began to license its recipes to other manufacturers, which would either handle distribution or sell to other distributors. Today Cool Mountain works primarily with Dr. Pepper Snapple Bottling Group Inc. in West Jefferson, North Carolina, and Real Soda Ltd. in Gardena, California. Mr. Daker’s largest customer, Ingels Markets Inc., a chain of 200 supermarkets in the Southeast, accounts for 10 to 15 percent of business. That sales are growing at all in 2014 says something about Cool Mountain’s cachet. Total volume of carbonated soft drinks fell 3 percent in 2013, the ninth straight year of decline and the lowest since 1995, according to Beverage Digest LLC, an industry tracker in Bedford Hills, New York. And while Cool Mountain just has begun selling in Illinois—it had been blocked by exclusivity clauses with some distributors—Mr. 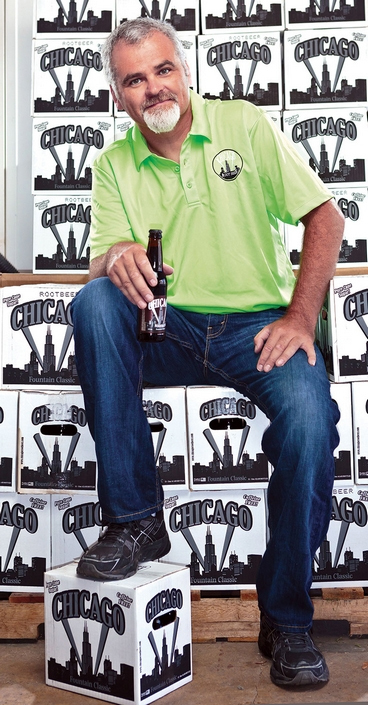 Daker launched another brand, Chicago Root Beer, here in 2011. It’s made in Chicago and sold in kegs. Chicago Root Beer makes up 20 percent of the company’s revenue, with a quarter-barrel selling for $45. Horseshoe Casino in Hammond, Indiana, is the largest customer. This entry was posted on Tuesday, August 12th, 2014 at 3:50 pm and is filed under Beverage, Beverage, Financial Activity, Flavor, Growth, Menu Trends. You can follow any responses to this entry through the RSS 2.0 feed. You can leave a response, or trackback from your own site.